A record number of women ran for Congress this cycle and a record number won and will be seated next year. 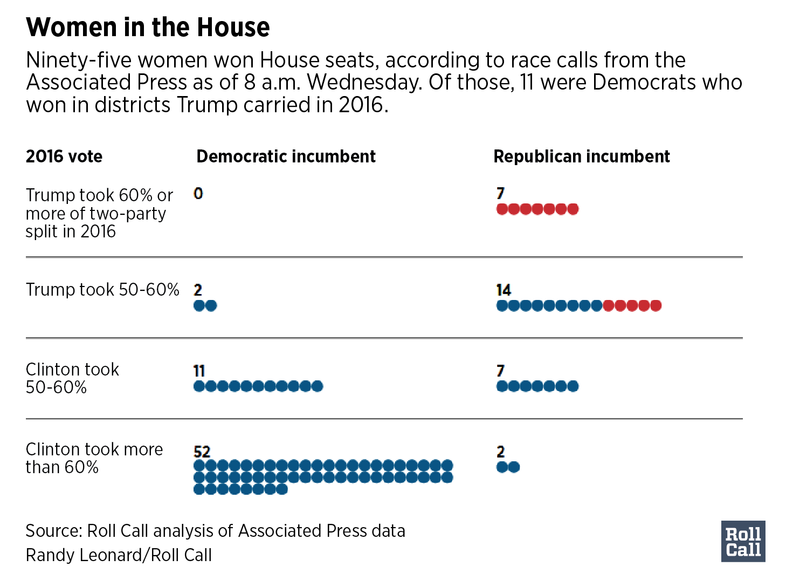 More women ran for seats up and down the ballot this year than ever before, including 237 women who ran for House seats and 23 for the Senate. The current Congress already had the most women of any Congress in history, with 84 in the House and 23 in the Senate. Next session, women are on track to make up around a quarter of all members. That’s far less than the overall U.S. population, which is 50 percent female. At least 13 women have won Senate seats so far. There were ten female senators who weren&apos;t on the ballot this year. That means that at least 117 women will serve in the 116th Congress, up from 107. Women will make up at least 22 percent of members, which is an increase from the current 20 percent. Not only will the next Congress have more women, but also more women of color. Fifty years after Shirley Chisholm became the first African-American woman elected to Congress, black women are still marking firsts. New England is sending its first black women to Congress, Ayanna Pressley from Massachusetts and Jahana Hayes from Connecticut. Pressley and Hayes are both Democrats and will join a diverse freshman class that includes at least 10 other black members. Utah Rep. Mia Love, who spoke at the 2016 Republican National Convention and is the GOP’s only black woman in the House, trailed by 2.6 percent to Salt Lake County Mayor Ben McAdams with 68 percent of precincts reporting early Wednesday in the 4th District. Democrats Sharice Davids and Deb Haaland will become the first Native American women elected to Congress. Haaland, an enrolled member of the Pueblo of Laguna, will replace New Mexico Democrat Michelle Lujan Grisham who vacated the seat to run for governor. Davids, a member of the Ho-Chunk Nation unseated Kansas Republican Kevin Yoder. Davids identifies as a lesbian, making her the first openly LGBT member of Congress from Kansas. Congress has been growing more diverse for decades, but it has lagged behind the nation as a whole. In 1981, when the national population was about 20 percent nonwhite, 6 percent of Congress were a minority. In 2001, minorities made up 12 percent of Congress, compared with 31 percent of the nation. Bronx Democrat Alexandria Ocasio-Cortez is the youngest woman ever elected to Congress, at 28. The title was previously held by upstate New York’s Elise Stefanik, a Republican who was first elected at the age of 30 in 2014. Abby Finkenauer, who turned 29 in December, was elected in Iowa. Sen. Dianne Feinstein and Rep. Don Young — both 85 — won their contests, cementing their roles as the elder members of each chamber. Oklahoma Republican Tom Cotton will be ousted as the youngest Senator by Josh Hawley, who defeated incumbent Democrat Claire McCaskill in the Missouri Senate race. Hawley is 39. The first two muslim women in Congress will be Midwestern Democrats, Michigan’s Rashida Tlaib and Ilhan Omar of Minnesota. Both previously served as state lawmakers. In addition to being among the pair of “firsts,” Omar will also be the first member of Congress to wear a headscarf, the first Somali American US legislator, and the first woman of color to represent Minnesota in Congress. Democratic Reps. Keith Ellison of Minnesota and André Carson of Indiana were the first Muslims elected to Congress; Omar and Tlaib will be the first Muslim women to serve. The next Congress will remain overwhelmingly Christian. The freshman class is shaping up, as of Wednesday morning, to include at least 68 Christians, including famed Mormon Mitt Romney of Utah. Wednesday morning’s tally of the incoming lawmakers includes six who identified as Jewish to Roll Call. The current congress, 90.7 percent of members who say they are affiliated with a specific religion identified as Christian. The number of veterans in congress has been on a steady decline in recent years and Tuesday’s election results likely won’t change that trajectory. Across the country, 77 veterans won elections. There were 15 veterans in the Senate who were not up for re-election this year, which means that there will be at least 92 veterans in the 116th Congress. There are still a number of races with veteran candidates that have yet to be called. If all of those veteran candidates were to win (which is not likely) the total number of veterans would match the number that were in office at the start of the 115th - 102. Of the 77 election-night winners, 17 were candidates, which is biggest class of freshman veteran lawmakers since 2010. Almost half of the veterans set to serve in the 116th Congress served after Sept. 11, 2001. Of the 92, 25 are Democrats and 67 are Republicans.